December 2015. Shooting doesn't cut it against my regular opponents, so I need some heavy hitters. The chariots have a lot of punch, but there are no Napoleonic chariots at least not of the fighting variant. The closes thing to KOW's idea of an Ogre chariot is heavy cavalry. So I decided to proc chariots with cuirassiers. Obviously an Ogre wouldn't ride on a horse. After some pondering I decided on some kind of an polar bear for a mount. The rider was relatively simple, but it took seven iterations until I was happy with the bear. The first one was very much a teddy bear. Quickly I stopped printing the riders as this saves about one and a half hour of print time. The model to the right has a different snout. Failed miserably as bear snout, but I keep it's design in mind, if I ever have to do a wolf. 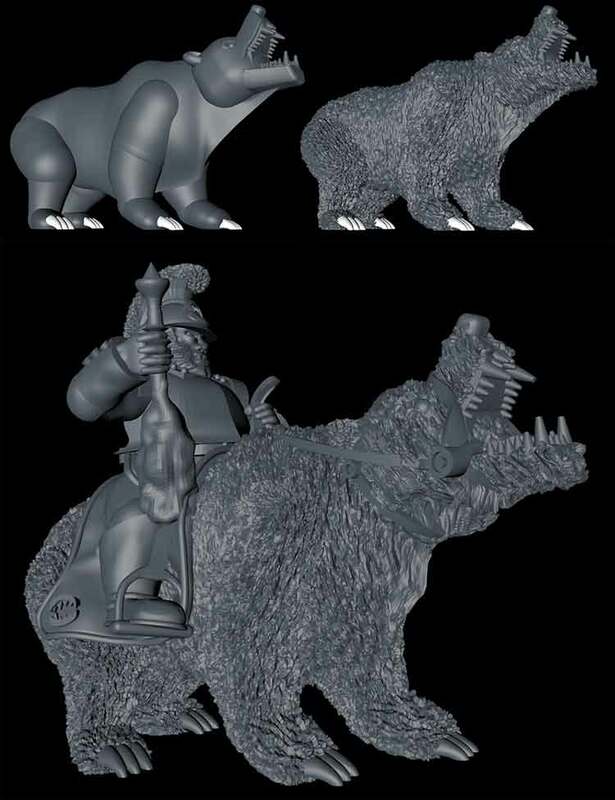 That's what the bears looks like in the CAD program. Starting out with a basic shape, adding fur and finally with saddle and rider. My opponents just smash through my lines, so it's time for something a bit more sturdy. I hope the Siege Breakers will be able to stop them. The inspiration for the Siege breakers have been French Sappers. The colors are British so, to blend with the rest of the army. There is a second set of Siege Breakers in the works. .They will have a bit more of a fighting stance. 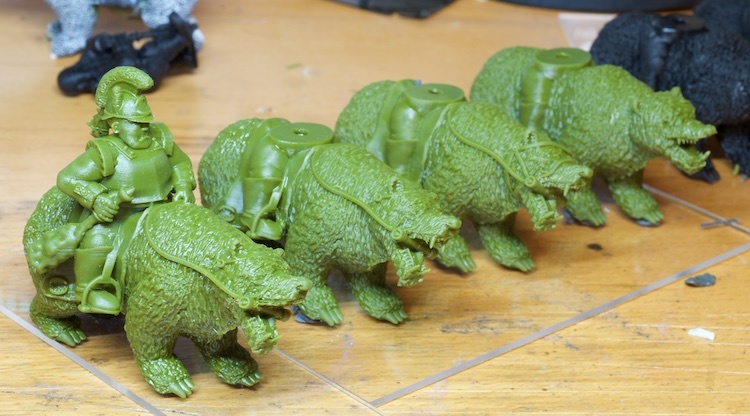 The army gets closer to completion step by step. The Siege Breakers are missing in the picture. The most asked question so far is "how much does a model cost ?" That's difficult to answer, because I do not really keep track of material and number of models printed. 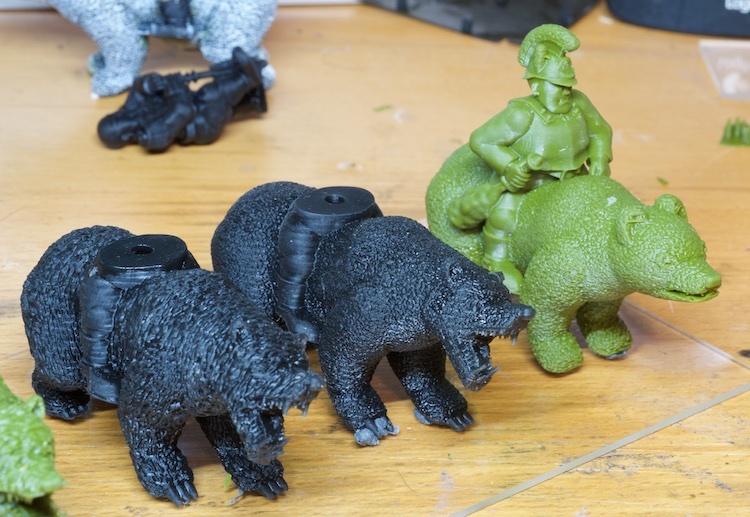 The resin cost per Ogre is theoretically about 2,40 Euro. Theoretically, because it does not include spill and waste. The army on the picture above took about two and a half bottles of resin. Cost about 400 Euro. I had to recoat the vat 8 times, which amounts to another 50 Euro. If we add another 50 Euro for paper towels, IPA and things I forgot, that's about 500 Euro. But what you don't see are the prototypes and design studies I printed. That's at least a third as many models. And I printed other stuff as well, so the 500 Euro might be for 1.5 of this army, reducing the cost for the "next copy of the army" to about 350 Euro. This does not take into account print- or design time or hard- or software cost etc.. This does not take into account the learning curve for the printing process, software and design. So it's not worth from the point of saving anything, be it time or money. But it allows me to design and "manufacture" my own miniatures which is in the end all I want - and wanted for a very long time. 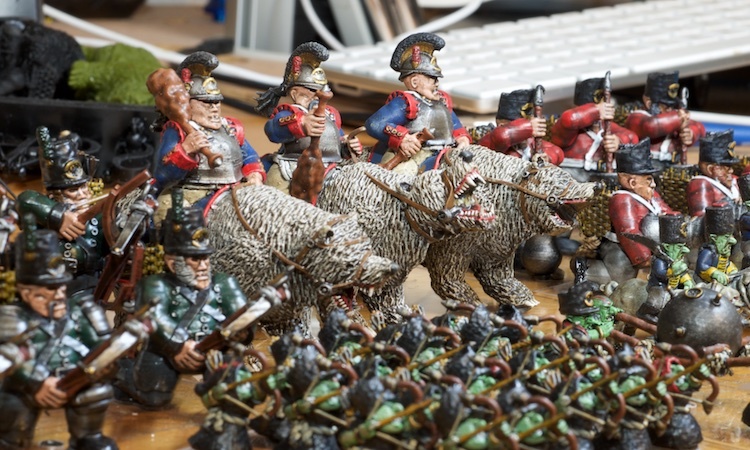 The number of readily available free good wargaming-models is very low. So if you are not prepared and willing to design your own miniatures, it's not really worth to invest this kind of money and time.